The West still deals with the twin "cognitive shocks" from the mid-nineteenth-century discoveries that extinction was the fate both of creatures very much like human beings and of cultures as articulate as those in the West, whose people can still speak directly to Western civilization because of their writing systems. On top of these are the twentieth century's scientific end-of-world scenarios, predicting the inevitable extinction of not only all life forms on Earth when the sun goes supernova, but of the entire universe, when entropy is complete and the last nuclear fires flicker out. Since WWII—particularly following the publications of Rachel Carson's Silent Spring (1962) and Paul Ehrlich's Population Bomb (1968)—sensitivities toward extinction have heightened with cold war fears of nuclear war, the obvious diminishment and degradation of the natural order owing to industrialization and burgeoning human numbers, and with millennial apocalyptic fears. With increasing regularity the news brings scientific findings of global warming, of a rapidly growing list of endangered and newly extinct life forms, of "earth-killer" asteroids lurking nearby, and of lethal pollutants in the air, soil, and water. The polar ice caps are melting as are the famed snows of Kilimanjaro. The blubber of orcas from the American Pacific Northwest found to contain PCB (polychlorinated biphenyls) concentrations up to 500 times greater than those found in humans. In the extreme, such phenomena are interpreted as symptoms of the beginning of the end of not only the planet's entire ecosystem but human beings as well. Extinction as the consequence of natural selection and the fate of the "unfit" was to become the metaphor for understanding not only natural but social phenomena as well, whether it be the success or failures of businesses or of entire cultural orders. It also found expressions in the justifications for war, exploitation, and forced sterilizations and genocides of human populations. The law of life from scientific perspectives holds that all life forms, ecosystems, planets, stars, and galaxies come and go. Personal death and collective extinction are the debts for life—on the individual, species, genus, family, order, class, and phyla levels. Since life first appeared on Earth 3.5 billion years ago, over 10 billion species have come into existence (and this figure is the roughest of estimates). Somewhere between 10 million and 30 million species (of which scientists have counted only about one-eighth) currently reside on the planet. In other words, for every 1,000 species that have ever existed probably fewer than 10 are alive in the twenty-first century. Challenging the conventional idea that "species were immutable productions," the naturalist Charles Darwin wrote On the Origin of Species by Means of Natural Selection, or the Preservation of Favoured Races in the Struggle for Life, explaining how life is a continuous process of modification and current life forms are descendants of extinct ancestral species. Natural selection is "the process by which genes change their sequences" (Ridley 2000, p. 35), by which those organisms best adapted to their environment survive to pass on their genetic code while those (previously "successful") life forms unable to make adaptive modifications to varying conditions perish. Species' billing on the stage of life is relatively short in terms of geologic time, with most becoming extinct within a few million years after their evolution. Most leave no related descendant species but rather become evolutionary dead ends. Life is a continuous process of extinction and diversification, where only the fittest life forms survive in a world where, according to Darwin, they are "bound together by a web of complex relations" (1963, p. 54). Central to these "relations" are the ecological niches, the millions of different "fits" and functional interdependencies that plants and animals have with each other in their ecosystem. While various creatures may share a habitat, generally a niche can only be occupied by one species of animal or plant. When two different organisms compete for a particular niche, one will invariably lose out. If a niche should become empty, such as through extinction, other life forms will rush in and compete to fill the vacuum. In the case of a mass die-off, evolutionary explosions of new life forms occur as plants and animals adapt to take advantage of the abundance of newly opened niches. Another factor affecting the rate of extinction and differentiation of life forms is the extent of biodiversity in an ecosystem. These natural systems comprising the biosphere do such things as cycle oxygen and carbon, purify the water, and decompose waste. Diminish the genetic variation in individual species and they become more vulnerable to extinction. Homogenize the biotas in human-dominated ecosystems and biodisparity declines. The diversity of life used to be considerably richer than is the case in the twenty-first century. For instance, based on the fossil record of the Cambrian Period over 500 million years ago, there may have been four to five times the number of phyla as exist today. Given present trends, this multiplier may be even greater in the near future as the site of the planet's greatest biodiversity, the tropical forests where between 50 and 90 percent of species reside, are rapidly disappearing. Worldwide, tropical forests four times the size of Switzerland are cut down annually, replaced with fields for cash crops and to make room for burgeoning human populations—which, in turn, pollute the water and land, further diminishing the variety and size of natural habitats. Though humans may be one of the only species to have adapted to nearly all environments on Earth, their existence nevertheless remains dependent upon the complex systems of inter-dependent life forms. The rate of extinction is far from constant. In addition to the routine processes of Darwin's natural selection, various terrestrial and extraterrestrial catastrophes have profoundly altered the course of evolution. Paleontologists report historic cycles of mass death, dooming or marginalizing a portion of previously well-adapted species, followed by steep increases in the diversity of new life forms. At least five periods of mass extinction have been identified, eliminating over half of the world's species at the time of their occurrence (although, in total, causing less than 5% of all extinctions). Scientific debate centers not on whether these mass die-offs have occurred but rather if they happened quickly, such as due to asteroid impact or a nearby star going supernova, or more slowly, such as due to glaciations, volcanic activity, changes in seawater oxygen or salinity, or epidemics. The time required for the species diversification to rebound to pre-catastrophe levels is estimated to be roughly 25 million years. Asteroids are suspected in at least the three most recent mass die-offs. Most publicized is the suspected 10-kilometer-wide meteorite that slammed into what's now the Gulf of Mexico and the Yucatán Peninsula 65 million years ago, leaving the 180-kilometer-wide Chicxulub Crater, wiping out the dinosaurs, and ending the Cretaceous period. Another is believed to have concluded the Permian period with even more devastating results, when 250 million years ago some 96 percent of marine and 70 percent of land fauna disappeared. Ironically, shortly after Jurassic Park 's release, the world witnessed over twenty parts of Comet Shoemaker-Levy collide with Jupiter. At least nine of these could have been Earth-killers, one forming a crater the planet could easily fit within. As of 2000, according to the British National Space Center, 284 asteroids have been located with the size and orbits to be deemed "potentially hazardous" to Earth. There is evidence that mass extinctions may number in the dozens, with up to three-quarters of all species disappearing every 26 to 30 million years. One explanation for this cyclical regularity is the possible existence of a companion star to the sun. Called Nemesis, when this star reaches its perigee every 26 million years, it shakes loose and hurls a comet storm from the Oort cloud on the fringe of Earth's solar system. Every 50,000 years or so, for over a period of 2 million years, one of these comets collides with Earth, producing ecological catastrophes that lead to periodic global deaths. Casualties Up to estimated 85% species and 45–60% of marine genuses killed. 70–80% of all species and 30% of families vanish; marine life more decimated than freshwater and land fauna. Most devastating of all, eliminating 85–90% of all marine and land vertebrate species, 95% of marine species. End of trilobites and many trees. More than three quarters of all species and one quarter of families disappear. End of mammal-like reptiles and eel–like conodonts, leaving mainly dinosaurs. 47% of marine genuses and 18% of land vertebrates wiped out, including the dinosaurs, leaving mainly turtles, lizards, birds, and mammals. Hypothesized Cause(s) Unusually fast plate movement; glaciation leading to sharp de- clines in sea levels. Unknown if one cat- astrophic event or several smaller ones–possibly large asteroid or asteroid shower over time; possible glaciation and lethal temperature de- clines; oceanic anoxia (oxygen-lacking) Possible asteroid; volcanic eruptions; dropping sea levels and oceanic anoxia Little known but suspected fall in sea level, oceanic anoxia, major increase in rainfall. Possible comet showers or asteroid impact. Suspected asteroid 10 km. in diameter hitting near Yucatán peninsula, coinciding with Siberian eruptions and dramatic climatic cooling. SOURCE: Adapted from A. Hallam, and P. B. Wignall, 1997; David Raup, and John J. Sepkosi Jr., 1986; and Lee Siegel, 2000. Human complicity in the Pleistocene extinction of large game animals remains a subject of debate, as there is a coincidence of receding glaciers, human migrations, and the extinction of many large game animals. The moa, a 400-pound flightless bird that thrived in New Zealand until about the year 1250, totally disappeared within 60 to 120 years of the first human arrival. Using fire as a weapon and tool, these settlers also burned into extinction an entire forest that was to become grassland. Similarly, woolly mammoths, camels, horses, sabertoothed tigers, and more than 120 other Pleistocene mammalian species all disappeared within a few hundred years after humans arrived in the New World roughly 11,000 to 13,000 years ago. Perhaps the most poignant of recent extinctions is the passenger pigeon, which was to be hunted into oblivion. At the beginning of the American Civil War, this was one of the most successful bird species in North America, comprising an estimated 40 percent of the entire bird population. In 1870, a single flock one mile wide and 320 miles long flew over Cincinnati. In 1974 the last surviving pigeon died in that city's zoo. As of 2001, conservationists estimated that one in every six species of birds is in decline on the continent and could wane by half by the year 2030. But the major cause of animal demise is the destruction of natural habitats as human populations exploded, tripling just between 1930 to 2000, leading to urban sprawl, overfishing, overgrazing, deforestation, overuse of pesticides and herbicides, strip mining, and pollution of fresh water systems. Human introduction of non-native "invasive" species has also taken its toll. Fungus carried by North American ships, for instance, led to the Irish potato famine. Of those who fled migrated to Australia with rabbits and cats, many of which went wild and decimated indigenous plants and animals. In Africa, the deserts annually expand thousands of square miles as a rapidly growing human population strips its indigenous vegetation for fuel (wood remains the chief energy source for many of its inhabitants) and to make room for profitable crops or livestock. Here the removal of ground cover leads to a greater runoff of rain, reducing evaporation into the clouds and thereby contributing to the severity of the region's routine droughts. The loss is not confined to wild, undomesticated plants and animals but includes domesticated ones as well. During the twentieth century, because of the rise of cash crops and farmers' cultivation for maximum yield, three-quarters of the genetic diversity of the world's agricultural crops was lost. Roughly half of all domestic animal breeds in Europe became extinct. Gone are about 6,000 apple varieties that grew on U.S. farms 100 years ago. In the mid-1990s, the United Nations Food and Agriculture Organization reported that nearly onequarter of the 3,882 breeds of 28 species of farm animals around the world were "at risk"—meaning fewer than 1,000 females or 20 breeding males. What worries experts most is the prospect that farmers will have a shrinking pool of breeds to draw upon to keep up with changing soil conditions, pests, and new diseases. In other words, concerns are for preserving biodiversity, particularly in light of cash crops and humanity putting its proverbial eggs in fewer and fewer baskets. Two groups of extinctions have intrigued humans over the past two centuries: the demise of the dinosaurs and of human ancestors. Over the final two decades of the twentieth century there was considerable research and public interest in the instantaneous (in geological time) demise 65 million years ago of dinosaurs, among the most successful (in terms of their length of reign on Earth) animals known. This interest coincided with the cold war, which was not coincidental. Humanity's ability to equally quickly make itself extinct through thermonuclear devices became a widely accepted fact. Another factor heightening cultural receptivity was the rapid disappearance of its own social past—for example, old crafts, buildings, social etiquette—producing a sense of irretrievable loss. Modernity had come to mean impermanence in a culture of obsolescence where the only certainty had become change. Unearthed in a quarry by Germany's river Neander in 1856 as an unusual humanlike skeleton with a beetled browed skull. This discovery of the Neanderthals, a tool-making creature very similar to Homo sapien, ultimately led to the unsettling insight that extinction has also been the fate of all branches of the hominid family and of the Homo genus except for human sapiens. Modern humans' complicity in the demise of these archaic humans remains a matter of speculation, with evidence indicating that humans shared the planet with at least the Neanderthals as recently as 26,000 years ago in Europe. Only in modern times has there been the realization that the planet's living resources are neither infinite nor always replenishable—and the scientific understanding of how precarious the interdependencies between all life forms are. People were surprised in the 1860s when human artifacts were first found with extinct species in Europe. Severely challenged were biblical allusions to some "steady-state" or regenerative natural order, the fauna descendents of passengers on Noah's ark, all of which were to be dominated by humans. Only later did people come to learn how the overkilling of "keystone species" could lead to an environmental collapse and the extinction of even nonhunted creatures. For those living within largely manmade environments and within a highly individualistic culture, appreciation of life's thorough interdependencies comes hard. Further, Cartesian conceptions of human's biological essence—the body-as-machine metaphor that has long predominated in medicine—complicates more holistic understandings. Limited is any acknowledgment of human complicity in the sixth mass extinction. According to 1993 and 1994 surveys of the American adult public conducted by the National Opinion Research Center, only 16 percent of American adults believe it is "definitely true" that "human beings are the main cause of plant and animal species dying out." Four in ten agree with the statement, "We worry too much about the future of the environment and not enough about prices and jobs today." And only one in three was "very" or "fairly" willing to accept cuts in his or her standard of living in order to protect the environment. The perspective from the scientific community is less benign. Several scientists have likened human effects on the ecosystem to cancer. If people take the Gaia perspective of Earth functioning like one mega living organism, aerial views can show striking similarity to melanomas attacking healthy tissue. The rise of the world economic order and its capitalist structure has accelerated the decimation of species. If, as Martin Luther King Jr. observed in 1967, capitalism has a tendency to treat profit motives and property rights as more important than people, one can easily surmise the importance it gives to the natural order. The system produces a bias toward short-term gains at the cost of long-term consequences. As mentioned, cash crops in the international marketplace have accelerated the end of many species. The price tag of the resultant reduction of biodiversity rarely enters into the market system's cost-benefit equation. This absence is due, in part, to the fact that people really don't know how to calculate the worth of such endangered species as snail darters or white spotted owls. In 1976 Daniel Bell wrote of the cultural contradictions of capitalism, perceiving them as seeds for change—or the death knell for entire social orders. One contradiction of relevance here is the economics of extinction, how the growing scarcity of a life form can increase its value and thereby accelerate its disappearance. For instance, in the 1980s when the market value of rhino horns exceeded the per ounce value of silver by ten times, this reduced the number of black rhinos in the Tanzanian Ngorongoro Crater from seventy-six to twenty-six in a single year. Pathetically, as their numbers declined the value of their parts hyperinflated, encouraging further exploitation. Another contradiction is how farmers will have a shrinking pool of breeds to draw upon to keep up with changing soil conditions, pests, and new diseases. With the remnants of endangered species increasingly likely to only be preserved within zoos, research institutes, and parks, matters of cost and utility enter. Consider, for instance, the perspective of zoos. To garner public support, animal collections must attract audiences. The most popular animals are often those that are "cute," furry, and large-eyed. Consequently, with time, Darwin's thesis of the survival of the fittest may have to be modified to be the survival of the cutest, like the black and white colobus or the arctic seal. Also saved will be those creatures that enhance humankind's own longevity, such as apes or pigs for xenotransplantations. Concerns over the loss of the tropical rain-forests are often expressed in terms of human needs. One-quarter of prescription drugs are extracted from plants, including 70 percent of anti-cancer agents, and most of these come from tropical forests—where less than 1 percent of the flora has been examined for its pharmacological utility. At the beginning of the twenty-first century, decisions as to whether the needs of humans ultimately outweigh those of endangered species are largely the monopoly of political regimes. However, the planet's greatest biodiversity largely exists within developing nations where fertility rates are the highest, people the poorest, population pressures on nature the greatest, and unstable political regimes the least likely to resist powerful corporate and population encroachments on natural habitats. Even in developed nations the accelerating rates of extinction have proven difficult to resist. The Green movement remains a minority voice. In the United States, awarenesses have become politicized. National surveys of 1993 and 1994 show Republicans are, for instance, 50 percent more likely than Democrats to disagree that "human beings are the main cause of plant and animal species dying out." And just when environmental causes have entered the public consciousness, ecoterrorism (or threats thereof) has become a new weapon of disenfranchised and antiestablishment groups. During the summer of 2000, soon-to-be-laid-off chemical workers in Northern France dumped 3,000 liters of sulfuric acid into a tributary of the Meuse River. The notion that humans are programmed by only 40,000 or so genes and descended from a chain of earlier life forms profoundly challenged traditional religious beliefs that life and death are acts of divine will. From the scientific method came the possibility that the cosmos was not divinely constructed around humanity but rather is the product of random chance, and that the same natural forces controlling the fates (and inevitable extinctions) of animals shape human fate as well. Also assaulting people's sense of specialness is the evidence that human beings and their fellow thinking mammals are not the "fittest," as 95 percent of all animal species are invertebrates. According to the Bible, God made human beings in his image and gave them dominion over all other creatures, whose existence was to serve their needs. To this day religion maintains this subordination of the natural order. When a random sample of Americans were asked whether "animals should have the same moral rights that human beings do," their agreement decreased with increasingly religiosity. When asked if "it is right to use animals for medical testing if it might save human lives," agreement increased with increasing religiosity. Accused of causing "speciesism," Christianity has played a limited role in the war against extinction. Instead, the scientifically prompted ecological movement has come to assume some quasi-religious characteristics of its own. So why the extensive attempts to save the California condor, whose diet at its peak 1 million years ago consisted of such currently extinct creatures as dead mastodons, or the Kemp's Ridley turtle that, with a brain cavity the size of a pencil-width hole, is unable to learn a thing from experience and whose existence is totally hardwired? The reason may be largely symbolic. The cultural war against death has expanded beyond the medical front to include battles against extinction in the natural order—and even resurrection of the extinct, as when in 2000 scientists awakened dormant 250-million-year-old bacteria encased in a salt crystal. Through human intervention, creatures extinct in the wild, like the Arabian oryx, are preserved in species preservation programs in zoos, ideally to be reintroduced to their native habitats. (In fact, there are cases where animals presumed extinct have been "discovered" in zoos, such as the Cape Lion, which was rediscovered in zoos in Novosibirsk, Serbia, and in Addis Ababa, Ethiopia.) In addition, genetic repositories, the contemporary "Noah's Arks," have been established by the Museum of Natural Science at Louisiana State University and the American Museum of Natural History to preserve in liquid nitrogen tissue samples from thousands of different creatures. In 2001, tissue frozen for eight years was used to successfully clone a gaur (a large type of cattle). Perhaps in reaction to the extinction of the passenger pigeon, considerable press has been given to attempts to rescue the whooping crane from oblivion. This cause célèbre is a white crane with a seven-foot wingspan, mistakenly believed to be extinct in 1923. The victim of overhunting, its numbers had dwindled to about fifteen in 1941—this, despite the Migratory Bird Treaty Act of 1918, which brought market hunting of the cranes and other migratory birds to an end, and the 1937 creation of the Arkansas National Wildlife Refuge on the Texas coast to protect the crane's last wintering ground. The U.S. Fish and Wildlife Service began a whooping crane recovery program in 1967, relying initially on captive breeding to build up the population. As of 2002, there are roughly 300 of the birds. In the broader cultural war against death, battles against extinction have assumed numerous fronts, such as conservation biology, gene banks, attempts to clone endangered species, and habitat restoration. Numerous new social solidarities have arisen, crosscutting the stratifications of class, gender, and age, in such groups as Friends of the Sea Otter, Sea Turtle Restoration Project, and Trees for the Future. Growing concern over "ecocide" and "biological meltdown" has given rise to increasingly politicized environmental groups (Greenpeace, the Sierra Club, the National Wildlife Federation, Friends of the Earth, and various animal rights organizations). This social movement has quasi-religious trappings in its demands for ecojustice and concerns for leaving a legacy for future generations. On the extreme fringe of this movement are the so-called ecoterrorists, such as the Earth Liberation Front and the Animal Liberation Front. Radical environmentalists, such as Finland's Pentti Linkola, see mass human death as the only way to save the planet's fragile ecosystem. This Voluntary Human Extinction Movement has the slogan "May We Live Long and Die Out." In addition to his hope for war, Linkola recommends ending capitalism, abolishing aid to the third world, and requiring mandatory abortions. Analogous to people's interest in extinct creatures is their curiosity about extinct civilizations, such as the mythical Atlantis or the Anasazis and Mayans of the New World, and the causes of these cultures' doom. As paleontologists study life forms of the past so archaeologists study past cultural orders, investigating whether their demise was due to avoidable factors with lessons that can be applied to the present. The archaeologist Richard Hansen, for instance, argues that deforestation produced an ecological disaster precipitating the collapse of the Maya civilization in approximately 800 C.E.To produce the stucco for their huge limestone pyramids, the Mayans leveled forests to fuel the hot fires required for transforming limestone into lime. Or was the fate of these doomed cultures sealed by unforeseen and uncontrollable calamities, such as epidemics, earthquake, or drought? The human war against death extends from battles against the extinction of biological to cultural systems. Memes are to anthropologists what genes are to biologists—carriers of life's organizing principles, ways of doing this, that are passed down generation to generation. And as biologists worry about diminishing biodiversity, cultural scientists worry about the abatement of cultural diversity and endangered languages. Of the 6,800 languages spoken worldwide in 2001—cultural DNA, if you will—only 600 are robust enough to be in existence at the end of the twenty-first century. The last speaker of Ubykh, for instance, died in Turkey in 1992 at the age of eighty-eight. As the fossilized remains of extinct creatures are the rage of affluent collectors so too are artifacts of extinct cultures. So lucrative is the market and so environmentally damaging are the attempts to satisfy demands that laws have had to be passed to ensure that remnants of the extinct themselves do not disappear. American Museum of Natural History. "National Survey Reveals Biodiversity Crisis-Scientific Experts Believe We Are in Midst of Fastest Mass Extinction in Earth's History." Press release, April 20, 1998. Browne, Malcolm W. "New Clues to Agent of Life's Worst Extinction." New York Times, 15 December 1992, C1. Carson, Rachel. Silent Spring Boston: Houghton Mifflin, 1962. Chang, Kenneth. "Creating a Modern Ark of Genetic Samples." New York Times, 8 May 2001. Darwin, Charles. On the Origin of Species by Means of Natural Selection, or the Preservation of Favoured Races in the Struggle for Life. 1869. Reprint, New York: The Heritage Press 1963. Davis, James A., and Tom A. Smith. General Social Surveys, 1972–1998. Investigator, James A. Davis; directed by Tom W. Smith; produced by National Opinion Research Center. The Roper Center for Public Opinion Research, University of Connecticut, 1998. [machine-readable data file]. Day, David. The Doomsday Book of Animals. New York: Viking Press, 1981. Erwin, Douglas H. "Lessons from the Past: Biotic Recoveries from Mass Extinctions." Proceedings of the National Academy of Sciences 98 (2001):5399–5403. Food and Agriculture Organization. "Up to 1,500 Animal Breeds Are at Risk of Extinction, FAO Warns." United Nations Press Release 3628, 7 December 1995. Gould, Stephen J. Wonderful Life: The Burgess Shale and the Nature of History. New York: W. W. Norton, 1989. Hallam, Anthony, and P. B. Wignall. Mass Extinctions and Their Aftermath. New York: Oxford University Press, 1997. Hern, Warren. "Is Human Culture Carcinogenic for Uncontrolled Population Growth and Ecological Destruction?" BioScience 43, no. 11 (1993):768–773. Holdaway, Richard, and C. Jacomb. "Rapid Extinction of the Moas (Aves: Dinornithiformes): Model, Test, and Implications." Science 287, no. 5461 (2000):2250–2254. Leakey, Richard, and Roger Lewin. The Sixth Extinction. New York: Doubleday, 1995. Lewis, Paul. "Too Late to Say 'Extinct' in Ubykh, Eyak or Ona." New York Times, 15 August 1998, B7. Lowe, Sarah, Michael Browne, and Souyad Boudjelas. 100 of the World's Worst Invasive Alien Species. Auckland, New Zealand: Invasive Species Specialist Group, 2001. Miller, George T. Living in the Environment: Principles, Connections and Solutions, 8th edition. Belmont, CA: Wadsworth, 1994. Montalbano, William D. "Agriculture's Gene Pool Shrinks Drastically Under Human Selection." The Wichita Eagle, 27 December 1993, 1A, 4A. Muller, Richard, Marc Davis, and Piet Hut. "Cometary Showers and Unseen Solar Companions." Nature 312, no. 5992 (1984):380–381. Osborne, Lawrence. "The Fossil Frenzy." New York Times Magazine, 29 October 2000, V1:70. Perlin, John. A Forest Journey: The Role of Wood in the Development of Civilization. Cambridge, MA: Harvard University Press, 1991. Raup, David M., and John J. Sepkosi Jr. "Periodic Extinctions of Families and Genera." Science 231 (1986):833–836. Sampat, Payal. "Last Words: The Dying of Languages." World-Watch 14, no. 3 (2001):34–40. Sepkoski, John J., Jr., and David Raup. 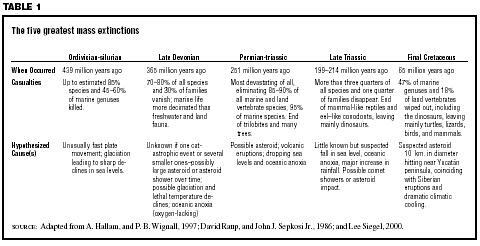 "Mass Extinctions in the Fossil Record." Science 219, no. 4589 (1983):1240–1241. Singer, Peter. Animal Liberation. New York: Avon, 1991. Smith, Jonathan Z. "A Slip in Time Saves Nine: Prestigious Origins Again." In John Bender and David E. Wellbery eds., Chronotypes: The Construction of Time. Stanford, CA: Stanford University Press, 1991. United Nations Food and Agriculture Organization and the U.N. Environmental Program. World Watch List for Domestic Animal Diversity, edited by Beate D. Scherf. 3rd edition. Rome: FAO, Viale delle Terme di Caracalla, 2000. MacDougall, A. Kent. "Humans as Cancer." In the Church of Euthanasia [web site]. Available from www.churchofeuthanasia.org/e-sermons/humcan.html . Pickover, Clifford A. "Immortalization of Humanity." In the Edge: The Third Culture [web site]. Available from www.edge.org/3rd_culture/story/27.html . Siegel, Lee. "The Five Worst Extinctions in Earth's History" In the Space.com [web site]. Available from www.space.com/scienceastronomy/planetearth/extinction_sidebar_000907.html .